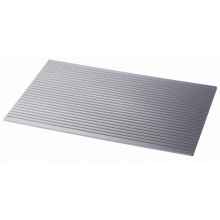 Our grill grid gives the juciest meat you can imagine with beautifulgrill stripes and our baking sheets are perfect if you desire the best possible result every time. Our grilling grids gives you those wonderful, classic grill stripes and the juiciest meat you can imagine – all thanks to iPinium’s unparalleled and patented aluminum alloy. Our products’ optimal capacity for absorbing, retaining and transferring heat as good as halves cooking time, compared to regular oven fry grids. At the same time our grids help preserve fluid in the raw produce. The food, quite simply, tastes better. Dishes also look more appetizing since the iPinium grilling grid gives a wonderful cooking surface with beautiful grill stripes. 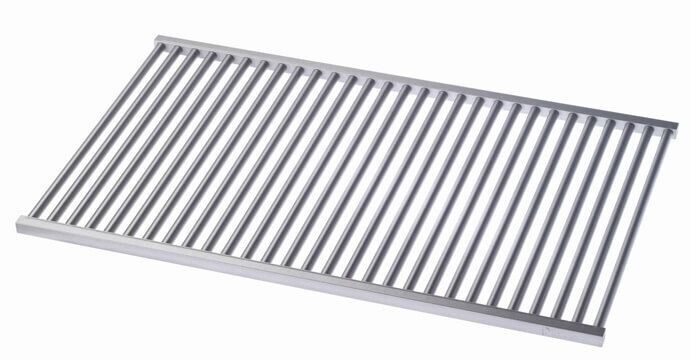 Our open grill grids are also suitable for use with frozen products. Moisture will drip down and you can use a container underneath for collecting this fluid. Our baking sheets are perfect for you if you bake a lot and desire the best possible result every time. The baking sheets do not shorten cooking time significantly compared to other sheets on the market, but they do offer you a wonderfully golden crust and crispy underside on your pizza or your rich bread loaf. There is no need to use any fat while cooking. The produce will not burn on our unique surface. This of course means that you can offer guests a healthier, more nutritious meal. After eating, when it is time to do the dishes, there is another surprise. All you need to get the fry grid sparkling clean is lukewarm water and a plain scrubbing brush. If you’re using a dishwasher, our tests show that you can halve washing time with an iPinium fry grid compared to a regular professional fry grid. This is what we mean with a whole new way of cooking!